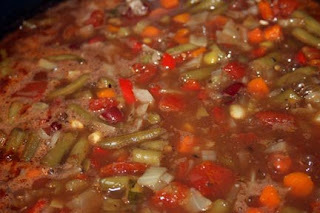 My vegetable soup is a recipe that my mama and I have been adapting and using for years. I'm not sure if there has ever been a real recipe for it. We like to make large batches and eat it with cornbread for several days. Once it's gone, we make another huge batch. At least that's what we did when I lived at home. Today marks ten years since I moved from my parents' house where I grew up in Georgia to Kentucky. I still make this soup but not nearly as often. It's hard to eat the whole batch of soup and keep making more when it's just me wanting it. I still make it almost weekly in the fall and winter though. My mom uses leftover roast beef (what some seem to call "pot roast") chopped up into bite size chunks in hers. I don't really think about it, and to me that's beef vegetable soup not vegetable soup. Somewhere along the way, we got into use dark red kidney beans for the protein and I think it works really well. So, here's a very loose recipe. I don't use all the vegetables all the time. This works with whatever you have on hand and like to eat. I pretty much always use green beans, because I always have them (my mom used to can up to 300 quarts of beans each summer - we always had green beans). I consider this a tomato-based soup, too, so I always use at least one can of tomatoes in some form (but not tomato sauce - it needs to be tomatoes). When I was in college (I think) we got introduced to Rotel by a boyfriend of mine (I think that's where this came from) and now I always add a can of Rotel. I think that's what makes this soup so addictive. The only time I don't use the Rotel is if I'm making it for someone else, and I'm unsure of their spicy tolerance. My tolerance is fairly low, so I don't consider this a very spicy dish. The beauty of the soup is that it tastes like soup, not the individual vegetables. When we were little, we would look at it, and say "I don't like butterbeans, I don't want butterbeans" or "I don't like corn, I don't want corn" and Mama would say "Close your eyes and eat it and you won't know it's there." Yes, that actually worked. You don't know it's there if you aren't looking at it. So I like to add vegetables that I don't normally care to eat but have high nutritional value. I kind of add things in a pot until it looks like enough. You'll have to go by the size of your pot. other various veggies, including 1/2 head of cabbage (I definitely don't always use this); frozen soup vegetable mixes (corn, butterbeans, peas, carrots, etc); 1 or 2 large potatoes, cut into bite size pieces (the smaller the pieces, the quicker they'll cook, but shouldn't be too small); squash; zucchini; any other veggies that sound good. Saute the garlic in a little bit of olive oil for a few minutes on medium heat. This is a change I made to the recipe. I just like sauteing garlic! Sometimes I will also chop the onion and saute it too. Sometimes I just chop into chunks and add it to the soup. Chop the carrots and celery into bite size pieces. If I'm in a hurry, I may throw them into the saute process before adding the other veggies just to give them more of a chance to cook. Then I start adding the cans of veggies and any other veggies I'm using. I don't always use potatoes, especially if I'm trying to lose weight. This soup is practically zero point if you're on Weight Watchers, so I try not to add additional points. If you've made your soup too spicy or salty, though, potatoes will help take away the heat and salt. Cook on medium heat until it's bubbling well, then turn the heat down to about medium low heat, and cook until done. Test the doneness of the harder veggies by cutting them with your stirring spoon or a fork. I like mine stay the same shape, but able to be cut through. You can cook it to your desired doneness, though. This can also be cooked in a crockpot. Just make sure that if you use potatoes, they stay under the liquid. Dried out potatoes in a crockpot are not good. If I'm using the crockpot method, I do not saute anything, and I will often put the soup together the night before and put it in the fridge overnight. If you do this and plan to use potatoes, put them in before adding the cans of vegetables with liquid. This will keep them under the liquid. I do not use any broths or stocks for my soup (although I think my mom does). I like the flavor of vegetables to come through instead getting a meat flavor. 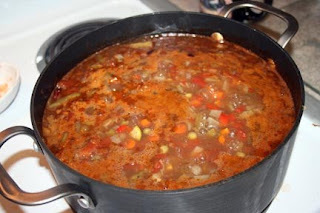 I do add some water as the soup cooks down if I don't put a lid on the pot. I know the soup commercial says that adding water to a soup is a bad thing, but I disagree if it's a homemade soup (or my homemade soup, anyway). If you're a little self-conscious about cooking, this is a good recipe to try. It doesn't matter what veggies you use and it's open to experimentation. I think learning to cook is all about learning what you like and trusting yourself to get there. I hope you enjoy my soup! Seeing as how I've had your veggie soup at lunch bunch i can testify to its yumminess! !